Hi friends! I hope you're having a lovely day! I fear today is going to be another rough one for me. I have no idea what brings on this pain and discomfort. I've tried examining what I did the day leading up to it but I haven't found any overlaps. Oh well. Hopefully, it will pass soon and I'll be back to myself. Today, I'm sharing a card I made for The Cat's Pajamas TCP Tuesday 206. This one was a HUGE challenge for me because it's SO trendy. I'm pretty uncomfortable when I feel things are on trend. I'm not much of a trendy person. I just kind of do whatever and hope that it works out. I looked through my Cat's Pajamas Stamps and this Puppy Love set really stuck out at me. I thought the envelope and this sentiment worked so well with this airmail theme. I also pulled out some airmail goodies. I used an Airmail Envelope from Glitter and Gloss. Aren't they the cutest? I also pulled out some Airmail Divine Twine which is one of my favorites. I pulled out some washi tape from Love My Tapes and some from Target and went to town. 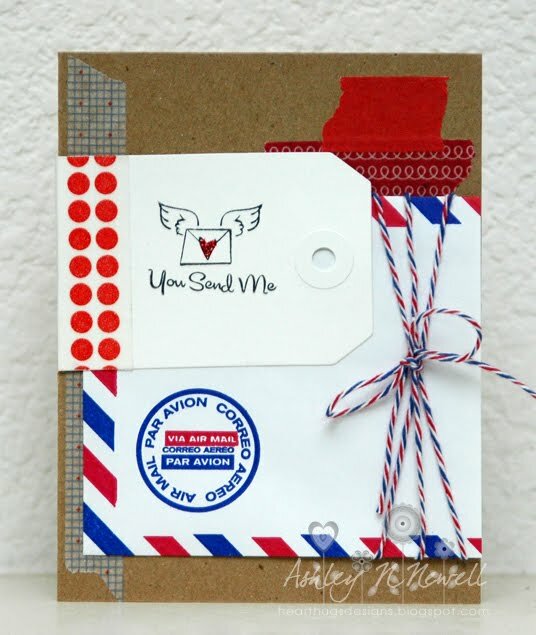 The general layout and idea for this card remind me of my friend Lauren from Lauren Elise Crafted. She's so trendy and young. Here's my attempt at trendy. Hope you like it! I love this one Ashley I think you hit it out of the park! This is fabulous, Ashley! Love the way you used all the different tapes. OHHH! SO Fun! LOVE this!! LOVE LOVE LOVE those tapes! !